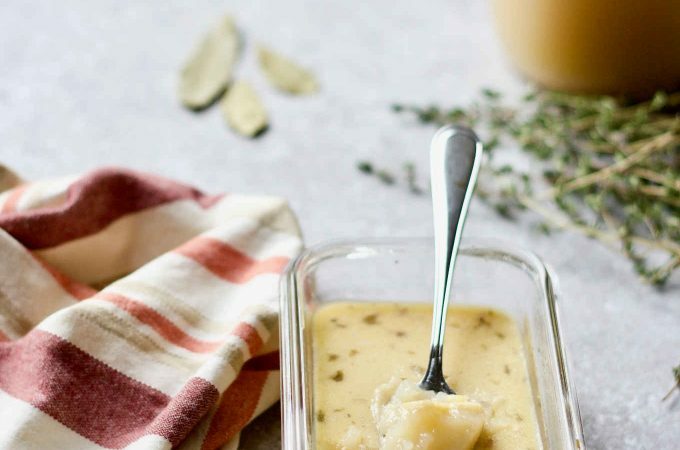 A healing and insanely simple chicken bone broth made in the instant pot. This shiitake ginger chicken broth is Paleo/AIP, GAPS and Whole 30. 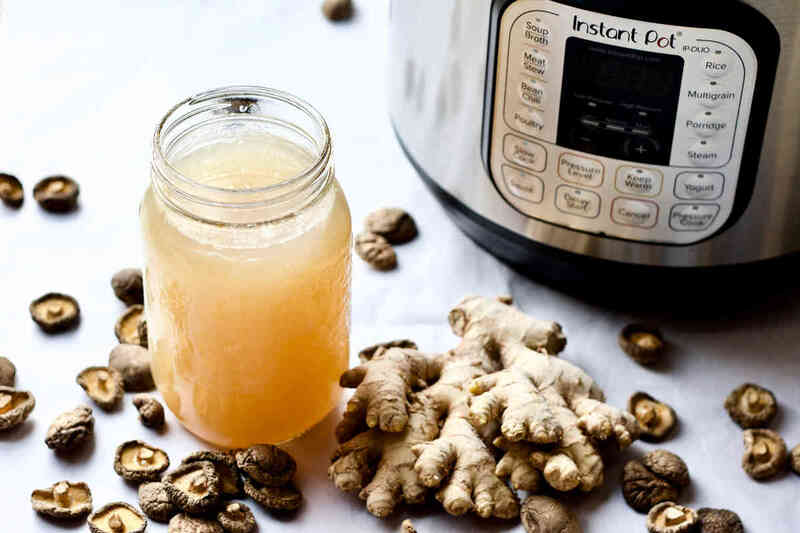 This all-purpose Asian chicken stock is insanely simple, because it requires only 4 ingredients (not including water): naturally-raised chicken carcass, chicken feet, dried shiitake mushroom, and fresh ginger root. 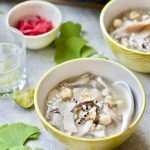 The shiitake ginger chicken broth is a perfect base stock in a variety of Asian recipes, such as soups (see my family favourite nourishing soup using this shiitake ginger chicken broth), congee, noodle broth, braised vegetables, and hotpot. Deciding on which model of the Instant Pot to buy had to be the hardest decision of Black Friday. After reading just about every article out there to help me make the choice, I ended up getting myself the DUO80 8qt 7-in-1 Instant Pot. The key reason for choosing 7-in-1 was for the “yogurt” functionality which would allow me to ferment rice (the “yogurt” functionality isn’t available for the 6-in-1 model); and the key reason for choosing 8qt was for the maximum capacity to make bone broth. I knew I would love my Instant Pot for all my beans porridges. Now I have had a few months to use my Instant Pot, I am completely happy with the choice of model as well – when it comes to broth making, that extra space is invaluable. The only thing slightly less than ideal is that pressure cooked chicken bone broth doesn’t taste as rich and intense as the one simmered on the stovetop; and it isn’t as white and cloudy either. 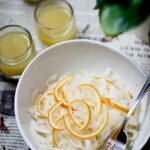 I then tried the “slow cook” functionality of the Instant Pot. Even using the “more” setting (highest slow cook temperature), the broth was barely simmering. The result was similar to the pressure cooked chicken broth. If you are someone who prefers a less cloudy broth, then it’s perfect. I prefer the more intense chicken broth because I think more nutrients are released from the ingredients. However, there isn’t an unanimous conclusion on which method is actually more nutritious. 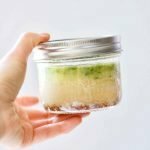 Will I continue to use my Instant Pot to make chicken bone broth in the future? Absolutely yes! It’s so much easier now that I don’t have to “babysit” my broth (my husband thinks it’s not safe to have the stove on when no one is around), which means we are now able to make bone broth more often than before. I reserve the stovetop bone broth for when I am home the entire day. 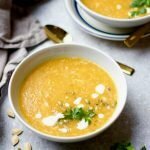 But if I have to step out or too busy to keep an eye on the boiling pot, the Instant Pot is the way to go – it makes chicken bone broth in a fraction of the time with pressure cooking, while giving me the freedom to be away from the kitchen. Shiitake mushrooms are a good source of vitamin B, helps to fight infections, boosts immunity and even prevent cancer. I love using dried shiitake mushrooms, because they have a greater aroma and a deeper flavour in soups than the fresh shiitake mushrooms. Dried shiitake mushrooms, as long as you seal them properly, store in the pantry forever. 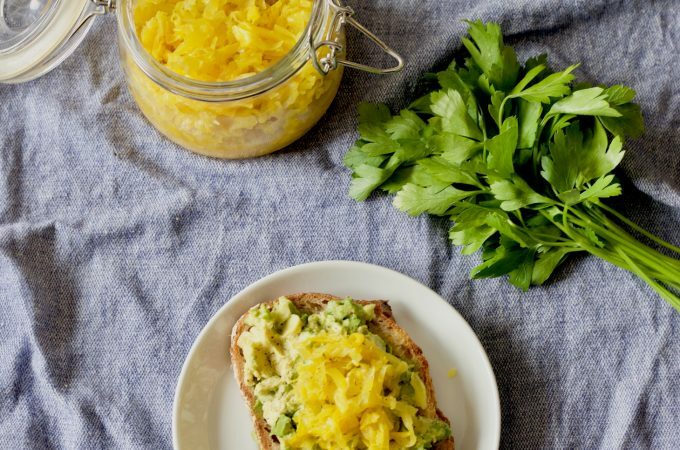 Ginger is anti-inflammatory and warm in energy. Both shiitake mushrooms and ginger roots are common ingredients to pair with chicken in Asian cooking and add nice flavours to chicken broth. Chicken bone broth made from chicken carcass and feet are rich in minerals, gelatin and collagen. 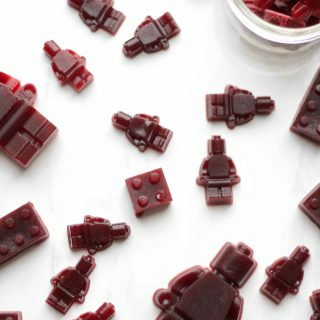 Gelatin and collagen contain some of the most abundant amino acids such as arginine, glycine, glutamine and proline. 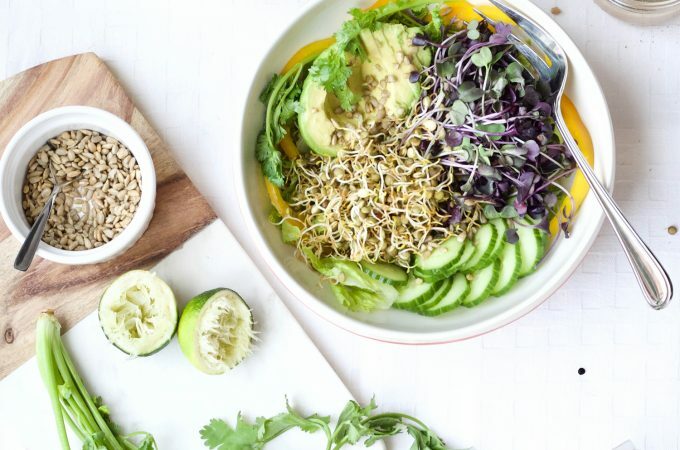 These important nutrients are particularly beneficial for gut healing, joint health, beautiful skins, and the immune system. Some folks may think proteins are proteins, and you can get them everywhere; they may even think the above-mentioned amino acids found in gelatin and collagen are no big deal because they are non-essential amino acids, meaning our body can produce them from essential amino acids. 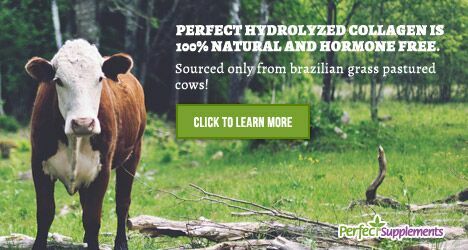 However, most people don’t know that when our body is not functioning at 100%, we can not produce enough of them; and those people eating a westernized diet of predominantly muscle meats do not receive much of these amino acids from foods. This is why bone broth is so healing and nourishing for children, elderly, postpartum women and those who are ill and immuno-compromised, because bone broth provides these important nutrients as a food source instead of relying on our bodies to produce the entire amount we require. 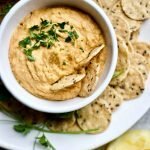 This recipe is written for the 8qt DUO80 7-in-1 Instant Pot. Reduce the amount of ingredients by 1/4 if using 6qt Instant Pot. Rinse the dry shiitake mushrooms to remove any sand and dirt. Soak the shiitake mushrooms in 1.5 cup hot water to rehydrate for half an hour or until soft. If you use smaller sized mushrooms, they will rehydrate faster. 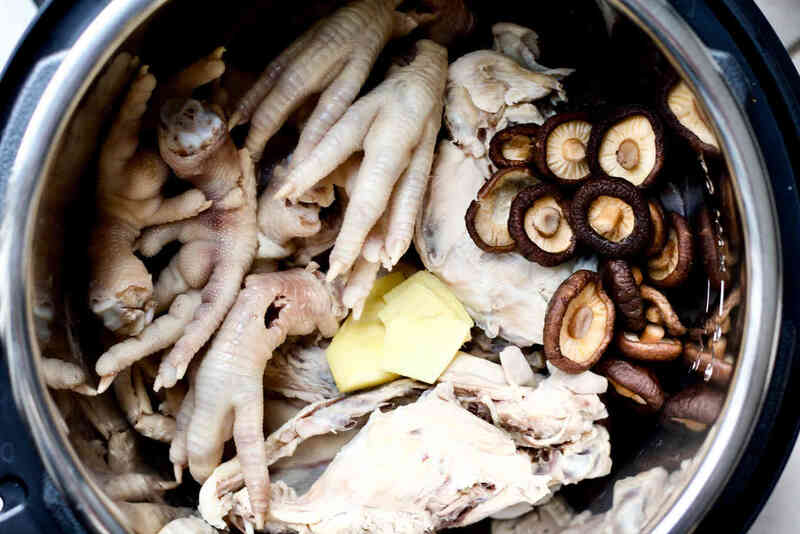 Immerse the chicken carcass and chicken feet in a pot of cold water in a stock pot. Bring the pot to a rolling boil for a couple minutes. This will remove the most amount of impurities. If you bring the water to a boil first before adding the chicken carcass and feet, the boiling water will seal the gunk inside. Discard the pot of water and rinse the chicken carcass and chicken feet. Place the blanched chicken carcass and chicken feet into the Instant Pot, add the rehydrated shiitake mushrooms and ginger root slices. Carefully pour as much of the mushroom soaking liquid into the Instant Pot, leave behind and discard any sediment and sand. Add 4 quarts of water into the Instant Pot. Take care not to exceed the maximum water level. I use the 8qt DUO80 7-in-1 Instant Pot. If you use the 6qt Instant Pot, reduce all ingredients proportionally. If using high pressure cooking, select soup/broth function, and then adjust the the cooking time to 3 hours (or 2 hours if your Instant Pot only allows 2 hours maximum); if using slow cook function, select "more" for the highest temperature, and then adjust the cooking time to 12 hours. Strain and store the chicken bone broth in glass jars in fridge or freezer. 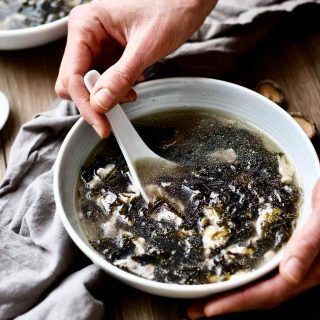 The shiitake ginger chicken broth is a perfect base stock in a variety of Asian recipes, such as soups, congee, noodle broth, braised vegetables, and hotpot. I most often use this bone broth as an ingredient in other Asian recipes, rather than drinking on its own. For drinking by itself, season with salt and pepper to taste. I usually eat the chicken feet after they are cooked. Chicken feet contain good gelatin and collagen to nourish our skins. If you don't want to discard the shiitake mushrooms, you can re-purpose them into stir-fries or chop them up to add into meatballs. I’ve been learning how to incorporate more umami in my dishes. The Dried shiitake mushrooms, seaweeds, dried baby shrimps are all high in the umami compound glutamates. Do you think that a tablespoon of miso paste, or a couple shakes of fish sauce would be good in your soup recipe? David, I agree miso and fish sauce are great to add umami too! This is a broth recipe that I often use as a base for soups where I add other vegetables and ingredients to flavour it. When cooking broth, it takes a long time to extract the flavour and nutrients from the foods. 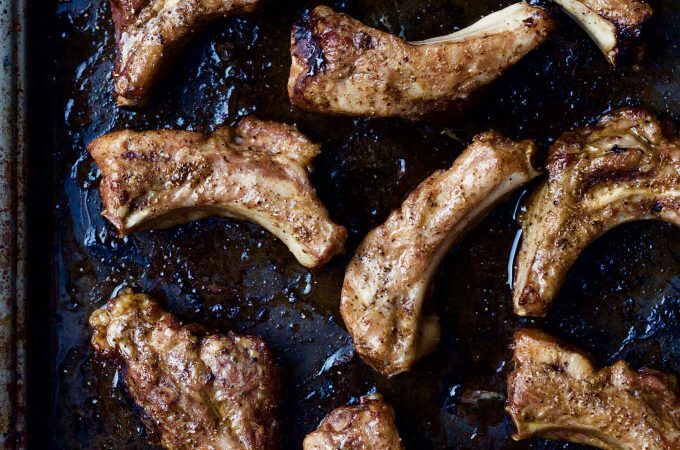 For example, dried shiitake, chicken bones, ginger all benefit from a long simmering in order to infuse the flavour and nutrients into the broth. On the other hand, fish sauce and miso don’t require long cooking time to infuse the flavour into soup/broth, so I usually add them at the time when I make my soups. Or if you drink the broth directly as-is, you can add those flavours when you serve. So to answer your question, I think definitely you can add other ingredients with Umami. 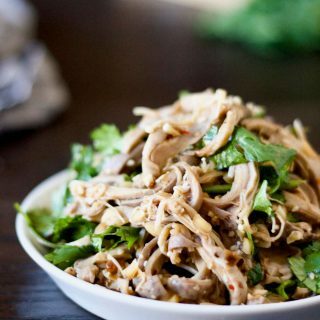 Whether one wants to add fish sauce and miso to this particular recipe is up to their personal taste. I would add ingredients such as fish sauce and miso at the end of cooking soup and broth for reasons stated above. Can I use fresh shitake instead? Yes, you can. Just keep in mind that dried shiitake tends to have a more intense flavour, therefore sometimes preferred in certain recipes. Ohh yum, I love shiitake mushrooms! I’m going to need to find some chicken feet for this!! I love the ginger addition! So I’m totally in agreement about the clarity of the stock from IP being so lovely, but I’m not 100% sure if it’s a nutrient dense as a slower simmer. Still, I really do only make broth in an IP anymore because I don’t love my house smelling of broth and I don’t have the time to babysit either! I appreciate your input on the Instant Pot choice. I’m still considering getting one. The store was out of them on Black Friday. :( As I started to read your post, I thought I might need a larger one. As I read on, though, I’ve decided to stick with my large slow cooker for my bone broth. I usually do two chicken carcasses at one time, and my big slow cooker gets hot enough to keep it boiling, if I let it. I am glad my experience helped! If I were in your situation, I would probably do the same thing as you, since you already have a slow cooker. 2 chicken carcasses fit nicely in my 8qt IP. But I don’t have a slow cooker and I had really missed having a pressure cooker for the beans I make. IP is so great for beans if that’s something you make a lot of. Look at all of those cute little shiitake mushrooms!!! I love them, they’re one of my favorites. 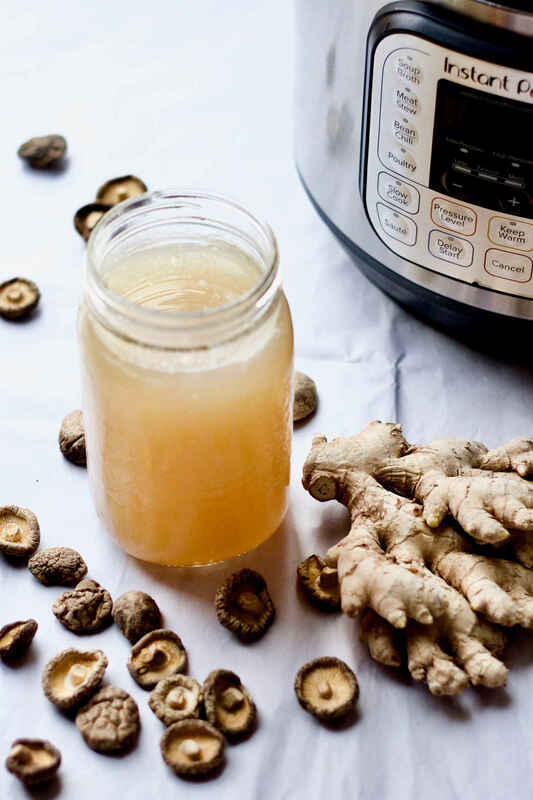 This is so lovely with the ginger addition too, I love how this broth is extra packed with nourishment. Love the addition of the shitake to your bone broth. can’t wait to try out your recipe! I make chicken foot broth regularly, but never thought to add mushrooms or ginger to it! I can see why that’s so beneficial! 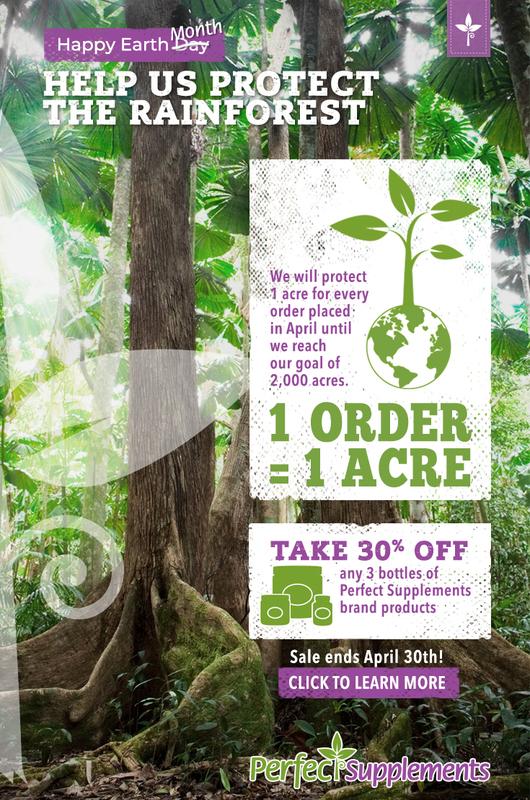 Will try on my next batch! 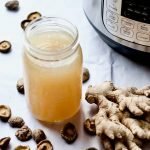 Love making my own bone broth, this looks like a great recipe! I love the Asian flavors! This sounds amazing! Shiitake mushrooms have the most intense flavor I love it! What a beautifully healing recipe for broth. I’ve studied mushrooms and their immune boosting properties are quite impressive, I love the idea of incorporating them into bone broth. And gosh I just want an Instant Pot so bad! Yes, Monique! Mushrooms are totally amazing – they actually aren’t plants as they are fungus, so there is this whole world of nutrients delivered by these little guys and we should be eating more often. I could drink a load of this broth!! Where you get your dried shiitake for a reasonable price? I would like to try this…have some chicken feet ready to go!! Tessa, these mushrooms aren’t cheap. I buy them from our local Asian market (I am lucky living in Toronto). The price is more reasonable if you find them in Asian grocery stores. In case you have nowhere to get them locally, I added an affiliate link in the article to Amazon. Love that ginger! I can definitely see the value in preparing the broth in the IP and I really appreciate how you share the differences in the final product using the IP vs stovetop! I love your idea of adding shitake mushrooms to the broth, how lovely…and ginger. MMM. Time to make broth, today. What a great idea! 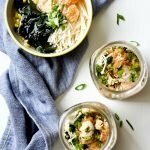 I never thought of making as asian broth before!